Steven Spielberg has tackled many war stories before with Schindler’s List, Saving Private Ryan, Lincoln, and War Horse. 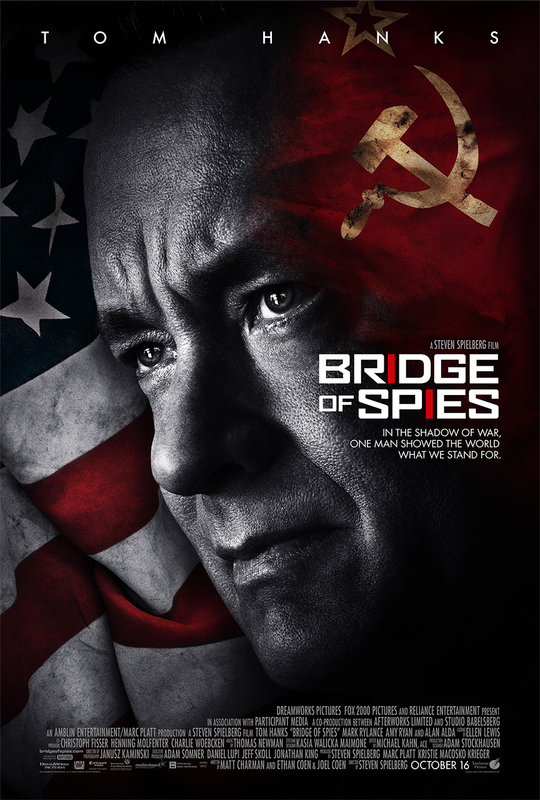 His latest film, Bridge of Spies, focuses in on the height of the Cold War in 1957. Tom Hanks stars as James Donovan, a Brooklyn insurance lawyer who is asked to defend Rudolf Abel (Rylance). He’s a Soviet spy who’s been captured and arrested for conspiracy to commit espionage. While most people would like to see him found guilty, Donovan believes he deserves a fair defense. This leads to public outcry, and he has now put his wife (Ryan) and children in jeopardy. At the same time, American U-2 pilot Francis Gary Powers (Stowell) is shot down over Russia while trying to take illegal photographs with cameras mounted on his plane. The same goes for Frederic Pryor (Rogers), an American student who is arrested in East Germany after a heated exchanged at the Berlin Wall, which is currently being assembled. Donovan is asked to negotiate the release of Abel for Powers. This becomes an extremely complicated task for him, as he feels more invested in making this a two to one exchange by adding Pryor into the mix. Like many Spielberg heroes before, Donovan becomes the underdog of our story, as he’s someone that believes in the law and what it means to do his job. There’s one particular scene where Abel points out to Donovan that he never asked him if the charges are true that he’s a spy. The story is inspired by true events. Spielberg also drew on many memories he had of his childhood to shape the relationship Hanks’ character has with his family. The screenplay was originally written by British playwright Matt Charman with some rewrites done by the Coen Brothers. This is not the first collaboration for Spielberg and the Coens as he was a producer on their remake of True Grit. It’s unlike other spy or war films as the tension is built through dialogue and suspicion versus continual action. It’s not a fast-paced film. It has the slow burn approach as you witness the injustices on display. There’s a power play at hand with each side trying to get their way in the end. The beginning scene is a prime example of how the rest of the film is shaped. It’s an almost dialogue free scene with no score as you watch Abel painting a self-portrait, sitting by the river, and riding the train all the while knowing he’s being watched and followed. It all leads up to a raid on his apartment. He acts completely innocent barely speaking a few words. With Mark Rylance’s subdued performance, Spielberg creates enough tension and the scene speaks volumes. The film is exceptionally crafted with a sharp eye to detail in every aspect. Between the production design, Janusz Kaminski’s cinematography, and the Thomas Newman score, you are put right into the chilly atmosphere of the late 1950s Cold War era. It’s probably safe to say that Spielberg’s frequent collaborators, producer Kathleen Kennedy and composer John Williams, had to sit this one out due to their work on Star Wars: The Force Awakens. This is Spielberg’s fourth collaboration with Tom Hanks as director and actor following Saving Private Ryan, Catch Me If You Can, and The Terminal. He is the ultimate everyman that you can trust and want to rely on. He’s noble, strong, and captivating. Much like his noted work in Captain Phillips, it’s not a lavish performance and stays away from any sort of comedic Hanks characteristics we are used to seeing form him. Tony winning stage actor Mark Rylance (who’s done a couple of shows at the Guthrie Theater) plays Abel. He’s a master at Shakespeare, but in Bridge of Spies, he reigns it all in to give Abel this very minimalistic exterior conveying this sense that he couldn’t possible be guilty. Internally, there’s so much more going on with Rylance letting you know this is all for show. Amy Ryan, Jesse Plemons, and Alan Alda all appear in supporting roles. We’re used to seeing the big blockbusters from Spielberg. They’re what I grew up on and inspired my love of the silver screen. He has also proven himself to be a dramatic storyteller giving us a history lesson into various wars and historical events. 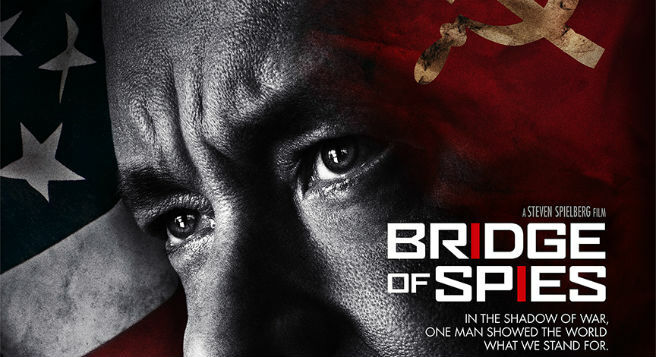 Bridge of Spies may not be as grandiose as Saving Private Ryan or Lincoln, but it still retains those Spielberg elements we know and look forward to with his films. It’s part spy thriller and part courtroom drama and Spielberg knows how to put you right in the thick of it asking you to pay attention, look for justice, and root for another Tom Hanks hero. Is It Worth Your Trip to the Movies? Bridge of Spies is just as sharp and exceptionally made like so many Spielberg films that have come before.